Join Haringey’s FREE guided ride to the Ride London FreeCycle! Join us on Saturday 1st August as we lead a family friendly ride in to central London to the Ride London FreeCycle! We’re meeting at 9.30am on Ducketts Common, opposite Turnpike Lane tube station, right in the middle of Haringey. We’ll be led by Andrew, our experienced Ride Leader (in the green bib below!) and there’ll be plenty of lovely ride marshals (in pink bibs!) to make sure the ride is enjoyable for everyone. There’s more information on the London Cycling Campaign FreeCycle led rides page too. 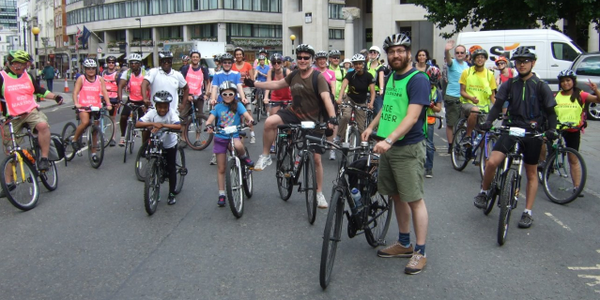 Everyone is welcome to join our ride in to central London, and return ride back again – we’d just ask that you spare 1 minute to register on the Ride London website, and select HARINGEY from the list of led rides available, so that we have a better idea of numbers. You can also register additional friends or family members once you’ve registered yourself. We’d love to see your photos from our rides, don’t forget to tag us if you post them online @haringeycyclist or email them to haringey@lcc.org.uk ! For full details, and for information about the return ride, register here.